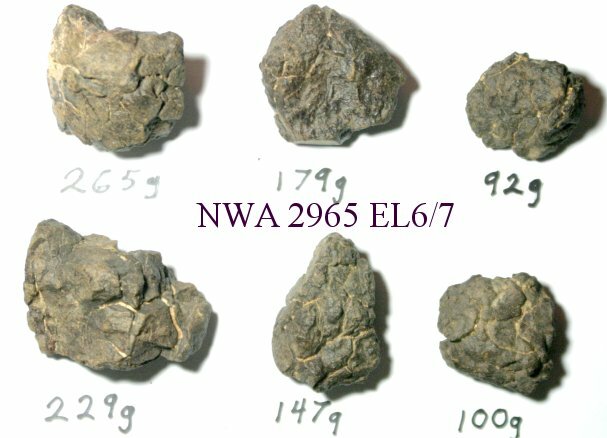 History: Hundreds of fragments that weigh >100 kg were collected in the Algerian desert in 2004. 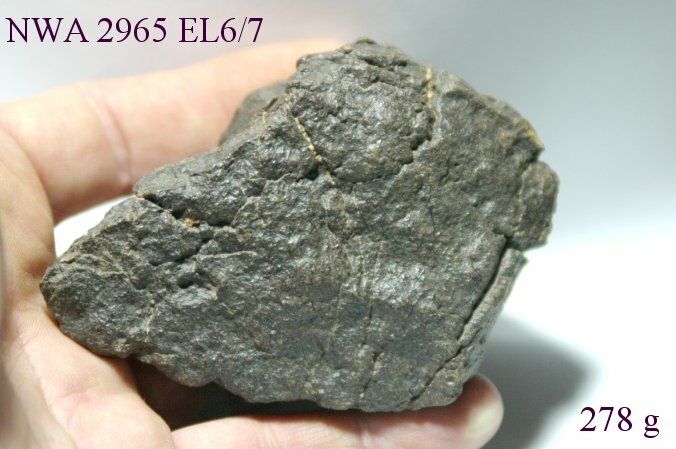 Small fragments (~100 g) are commonly weathered to a dark brown with very dark weathering veins. 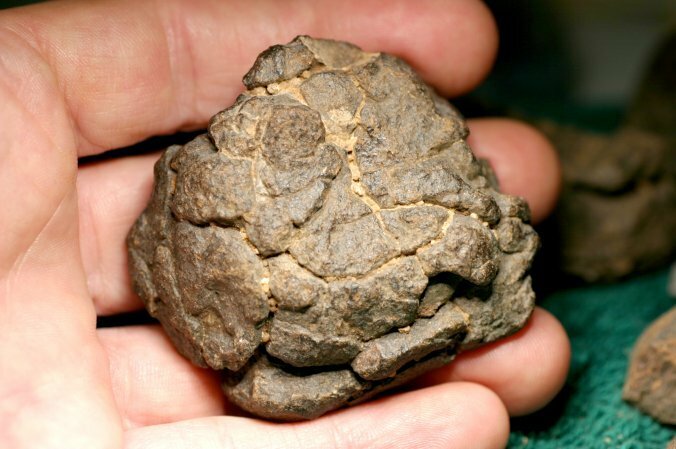 Large pieces may retain portions of weathered fusion crust with only moderate to lightly weathered interiors. Petrography: (T. Bunch and J. Wittke. NAU) A completely recrystallized enstatite chondrite with polygonal to irregular grain outlines. The grain size varies from 0.02 mm to 0.7 mm. Round, curved, blocky objects contain coarser-grained orthopyroxene than in the matrix. No relict chondrules, sensu stricto, were observed in ~32 cm2 that were analyzed. Metal, daubreelite, and tiny, vermicular grains of graphite are also present and constitute < 3 vol%. Geochemistry: Orthopyroxene (Fs98.4 ± 0.02), plagioclase (An17.8Or4.4), troilite with Ti = 0.91, Cr = 1.10, Zn = 0.6 (all wt. %). Classification: Enstatite Chondrite EL 6/7. 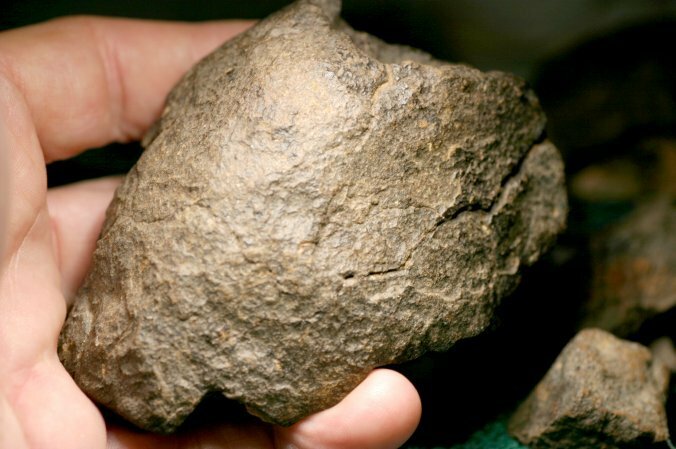 It has absolutely no evidence of chondrules. Low-level shock, the weathering grade ranges from W2-W5. Specimens: A 24 g sample is on deposit at NAU. Turecki/Reed hold the main mass. Price $2/g over 1kg $1.25/g examples below ! I recently acquired a large amount of this material and will pass on this saving to you . I have many complete very nice specimens with some fusion crust . I have many Kilograms to chose from if you are interested !